Somehow the idea of using hummus as a sauce in baking had never occurred to me. But as soon as she mentioned it, the recipe moved to the top of my list. So this weekend, I picked up some chicken and my favorite hummus (thought about going homemade, but I was in the mood for quick and easy). And then in order to make it a one-pot meal, I also picked up a bunch of veggies to bake up alongside the chicken. And then in less than 10 minutes of prep time, roughly chopped the veggies and added them and the chicken breasts to a big baking dish, slathered the chicken with hummus and some lemon juices, sprinkled on a little sumac (or you can use smoked paprika), and popped it in the oven. About a half hour later, I learned what “hummus-crusted” is all about. 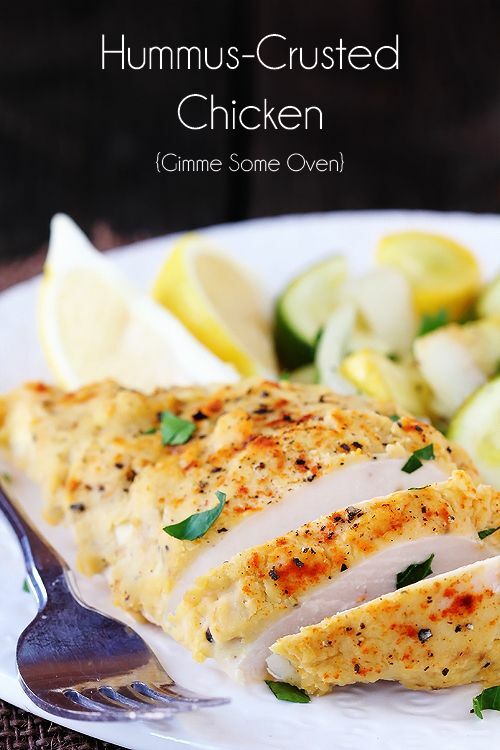 Hummus serves as the perfect sauce in this easy baked chicken dish! Preheat oven to 450 degrees. Prepare one large baking dish or two smaller baking dishes with cooking spray. Pat the chicken dry. Season the chicken breasts with generous pinches of salt and pepper. In a large bowl, toss the zucchini, squash and onion with olive oil until evenly coated. Season with salt and pepper. If using one baking dish, place all of the vegetables on the bottom of the dish in an even layer. Lay the four chicken breasts evenly on top, then cover each chicken breast with the hummus so that the entire breast is covered. 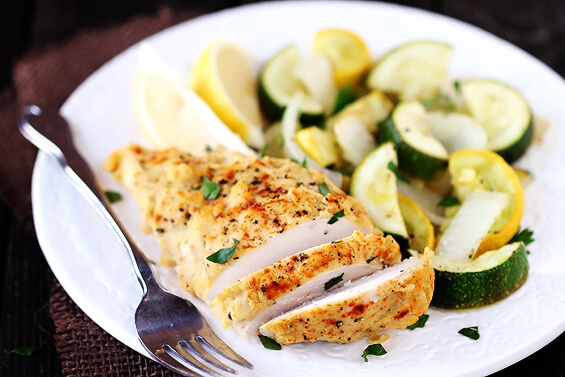 Squeeze the juice of one lemon over the chicken and vegetables. Then sprinkle the pan with smoked paprika or sumac. Thinly slice the remaining lemon, and place the slices in between the chicken and vegetables if desired. Bake for about 25-30 minutes, until the chicken is cooked through and the vegetables are tender. Serve immediately. 0 Response to "HUMMUS-CRUSTED CHICKEN"